I may be tempting fate by saying this out loud but it would appear that summer has arrived in the UK – yippee! Who knows how long it’ll last but with reports stating that 2016 is set to be the hottest year since records began, it’s looking promising. 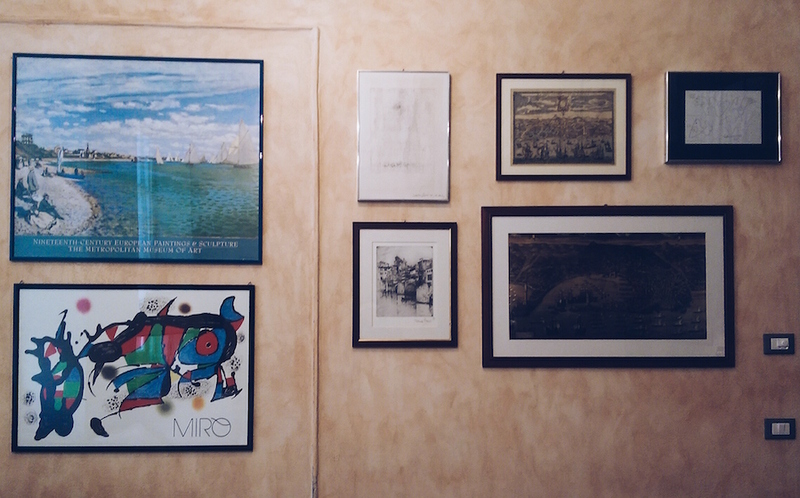 As a country famous for its temperamental weather, many of us are very good at bringing the outside in. 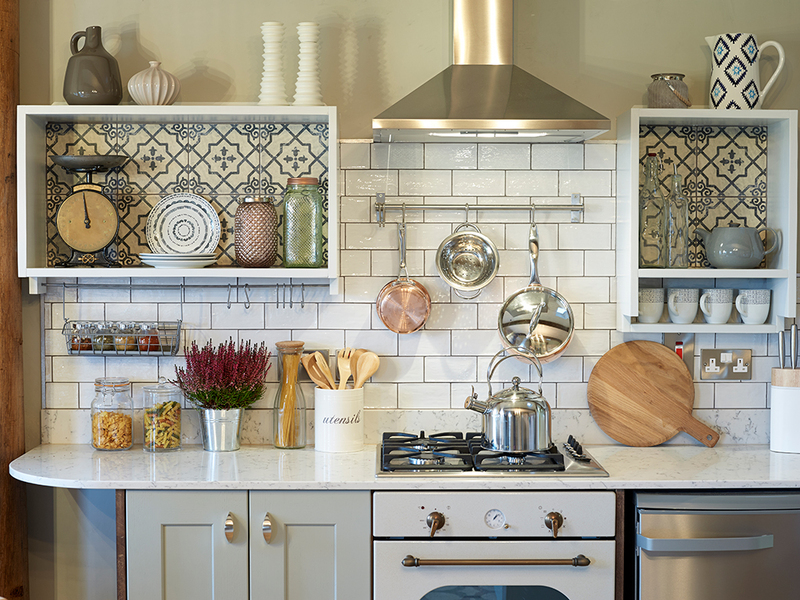 Lush house plants, fragrant herb pots and beautiful vases adorned with flowers decorate our homes so that we can still enjoy a little nature on those indoor rainy days. However, with the sunshine and warm weather out in force, we need to think about taking the inside outside for a change! Here are a few of my favourite ways to bring your living space outdoors. Having somewhere to sit is essential to creating an outdoor living space. Versatile and hardwearing options are perfect as they’re conveniently on hand whenever the sun decides to pop out. 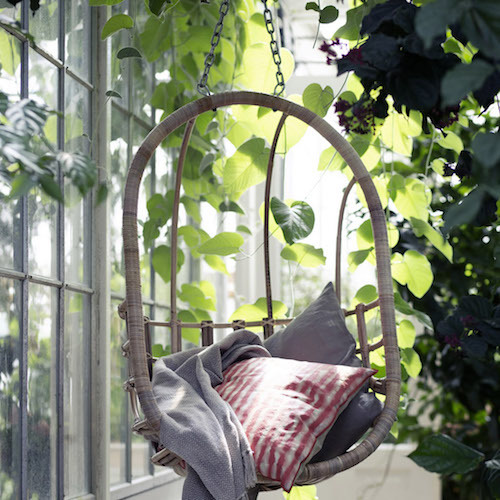 This rattan hanging egg chair is suitable for both indoor and outdoor use. Ideal for conservatories or outdoor terraces, it makes a lovely little nook for you to while away the hours, being rocked by the breeze. Available for £285.00 from Grace & Glory. Deck chairs are the easiest way to provide instant outdoor seating either at home or when you’re out and about. They’re surprisingly comfortable and the convenience of being able to fold them flat means effortless transport and space saving storage. 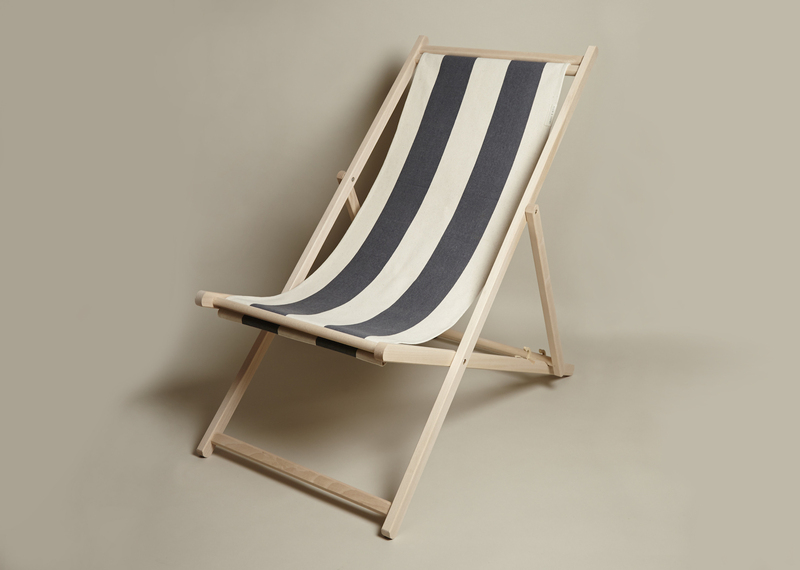 I’m loving the nautical vibe on this Plum & Ashby grey stripe deck chair, available for £85.00 from Black by Design. 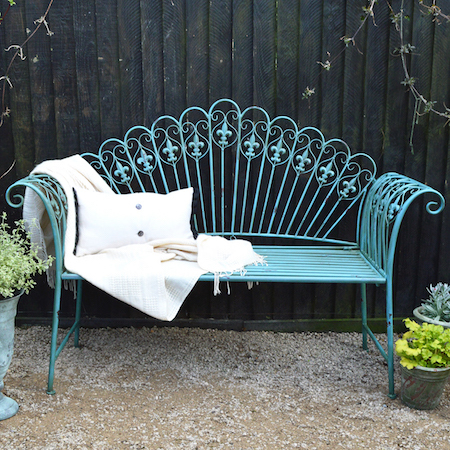 On the subject of peacocks, here’s a delightful turquoise bench to brighten up any garden. Made from powder coated steel for better corrosion resistance, it’ll stand up well to the elements and makes a lovely feature amongst some leafy foliage. The Peacock garden bench is available for £198.00 from MiaFleur. 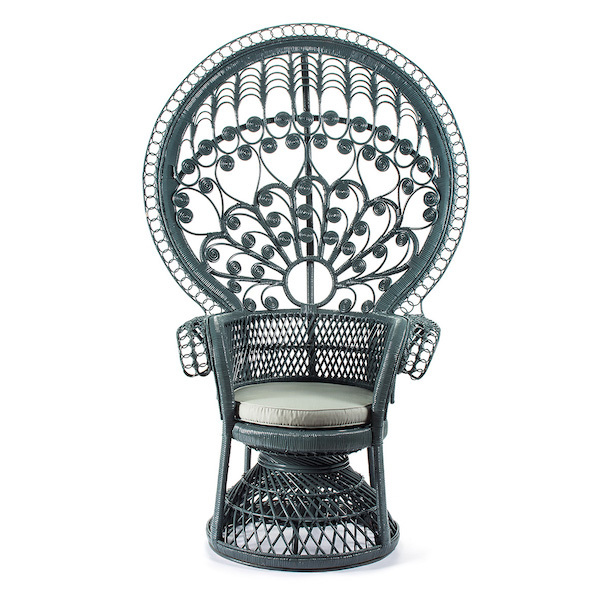 This super stylish chair will add some contemporary chic to your outdoor space, and looks good enough to keep indoors too. The elegant design is made up of galvanised, powder coated steel and recyclable resin meaning this is no case of style over substance. Being UV and weatherproof, these chairs will look the part for years to come. 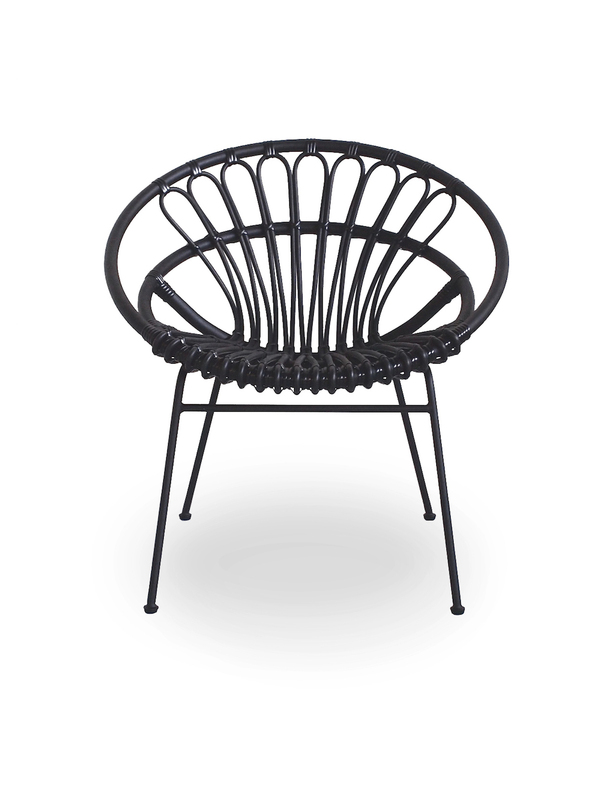 The Vincent Sheppard Roxanne outdoor lounge chair in black is available for £419.00 from Lagoon. What could be better than dining alfresco when the sun is scorching? Ok, I could do without the bugs but apart from that, it’s lovely! From picnics to BBQs, enjoy breakfast, lunch or dinner out in the sunshine. 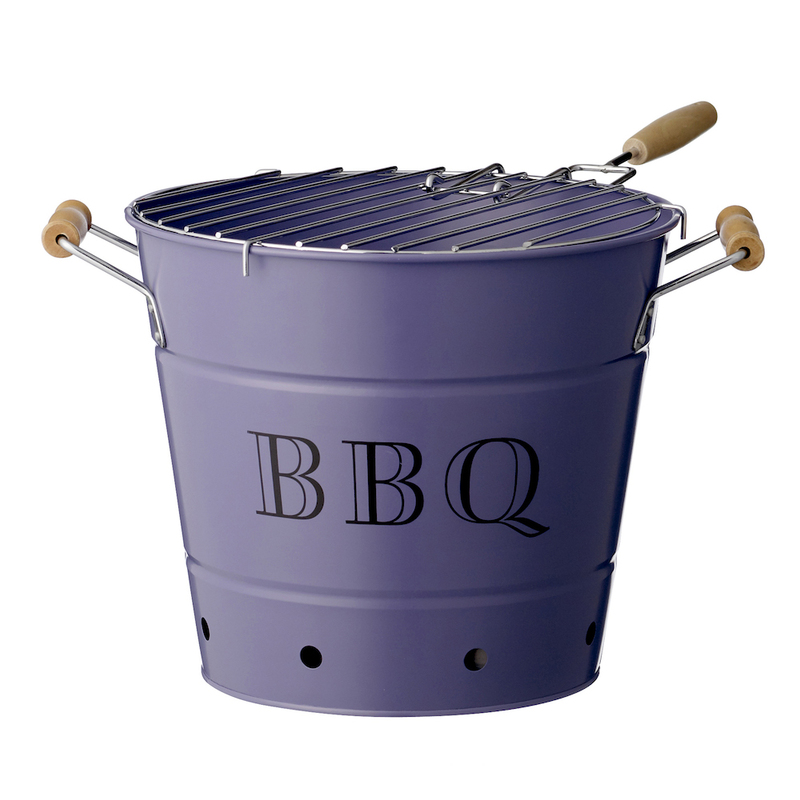 This adorable BBQ bucket comes in purple or black & white striped and is perfectly proportioned for small gardens or roof terraces. Available from Furnish.co.uk for £65.00. 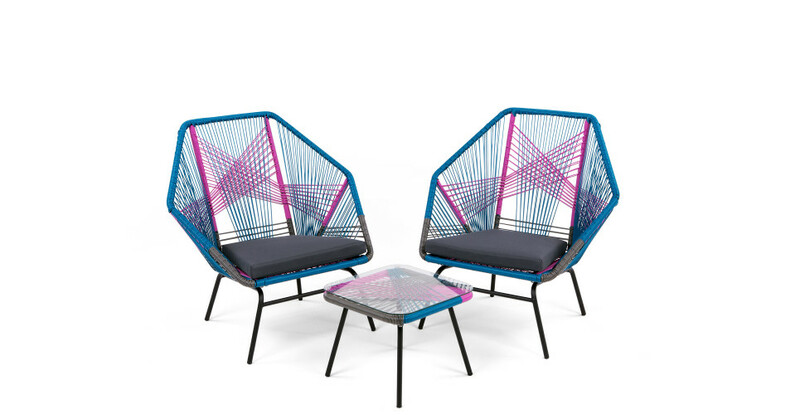 The cool geometric design combined with the vibrant colours of the Copa aperitif set will provide a stylish focal point for cocktail hour. The set costs £399.00 from Made.com. You can’t go wrong with a classic bistro set. Perch here on your patio or balcony with a macaron and an espresso, then imagine you’re sitting outside a little Parisian cafe. Plus it conveniently folds away for storage or take it with you on your next glamping trip! 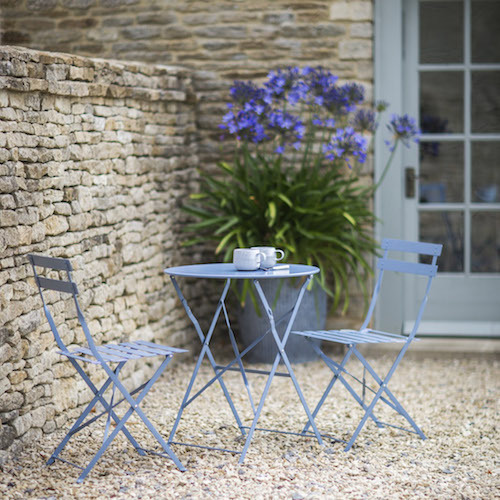 Bistro set of table and two chairs in Dorset blue, £115.00 from Grace & Glory. Oh how they will laugh when you turn up at the park with a briefcase. But once you open up this baby and whip out some burgers and halloumi skewers, everyone will want to be your friend. 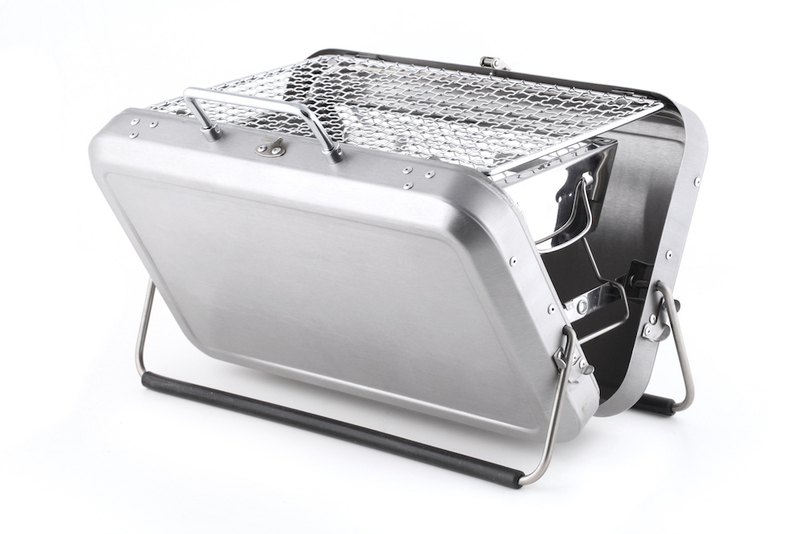 The portable BBQ briefcase is €100.00 from Kikkerland. See website for local stockists. We all want to be the hostess with the mostess but it’s far too hot to be running around fetching drinks for everyone. 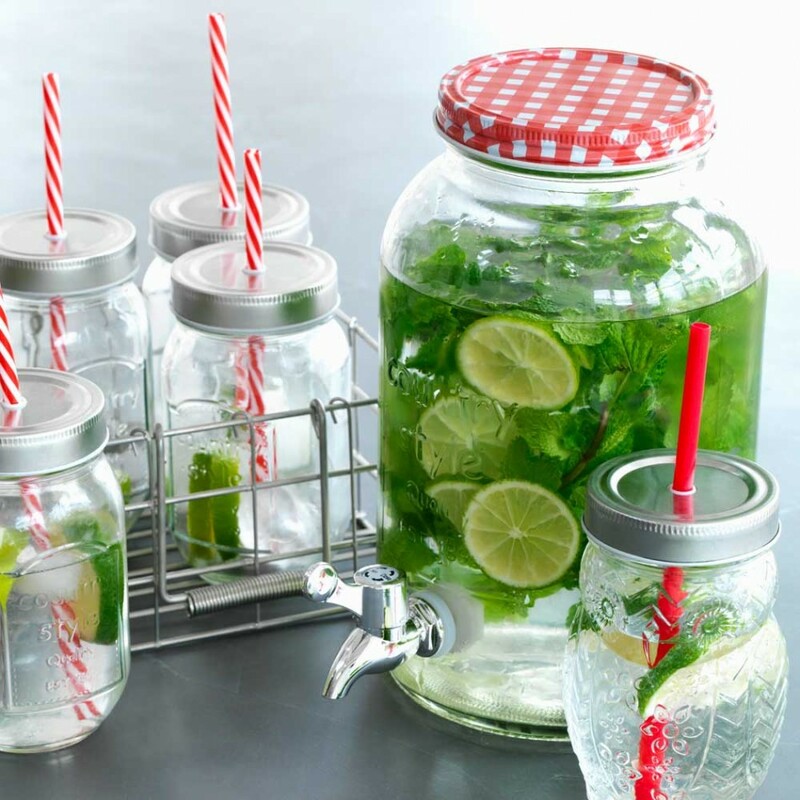 Make up a big batch of your favourite tipple in this retro glass urn then tell everyone to help themselves! Job. Done. Available for £24.95 from Graham & Green. This gorgeous painted wood butlers tray table is perfect when you’re entertaining, both indoors and outdoors. 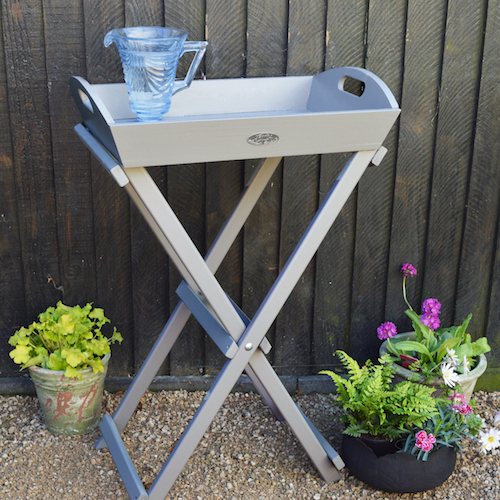 Carry out drinks and nibbles with ease on the handy tray then simply set down on the stand. The best thing is, it looks just as good in your living room as it does in your garden so you can use it all year round. Available for £64.00 from MiaFleur. I know there’s no such thing as a healthy tan but I just can’t resist it. I wouldn’t call myself a sun worshipper but on occasion, I am partial to a little sun bathing. It’s just a little vitamin D, right? Slap on the spf and soak up some rays in comfort and style with one of these lovely finds. Sun’s out, guns out! Top left: Who doesn’t love a hammock? This one’s a real beaut from one of my favourite design brands Day Birger et Mikkelson. Whether it’s for lying in the sun, shade or on cool summer evenings, it’s going to take no less than a flash thunderstorm to prise you out of here. Available for £259.00 from Rockett St George. Bottom left: This Talenti Kot sunbed designed by Karim Rachid is the epitome of luxury. 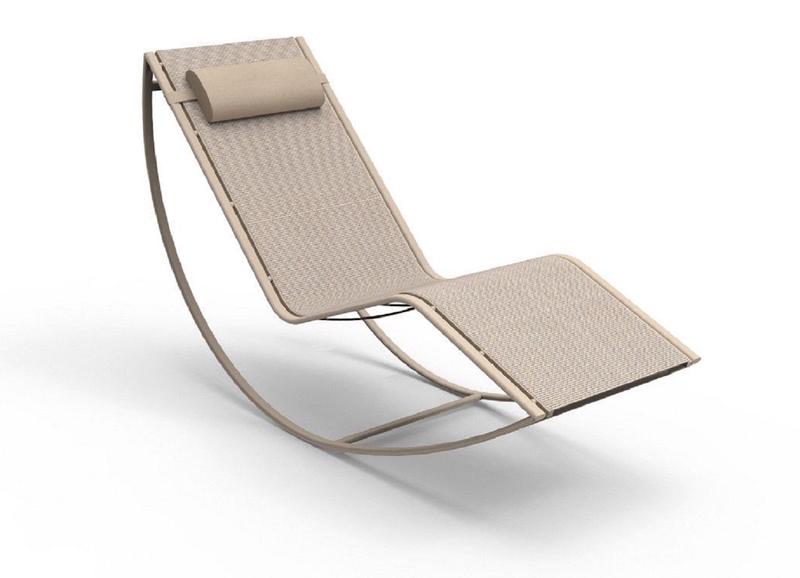 The elegant design is functional, lightweight and sturdy with its aluminium frame and weather resistant fabric. Perfect for lazing by the pool. Available for £1585.00 from Lagoon. 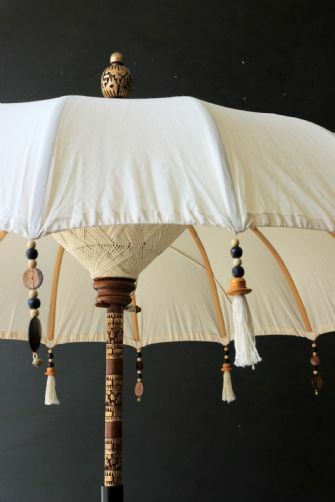 Right: When the heat gets too much, cool off under this beautiful boho beaded cotton garden umbrella. Create your own little outdoor haven underneath with blankets and cushions then weave flowers in your hair and write in your journal. Available from Rockett St George for £185.00. 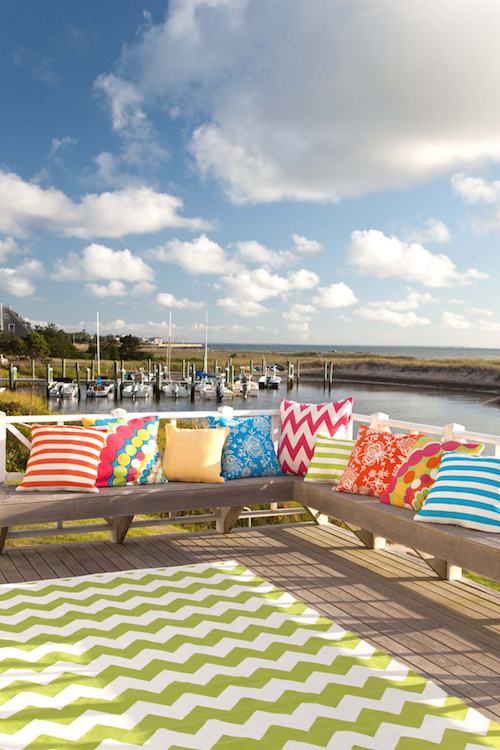 When we think of outdoor furniture, people often think of hard, uncomfortable seating or awkwardly lying on the ground. 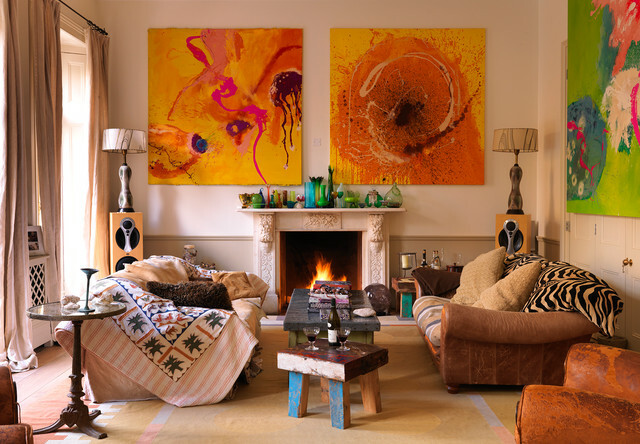 However, to truly bring the inside out, you need to bring some soft furnishings. 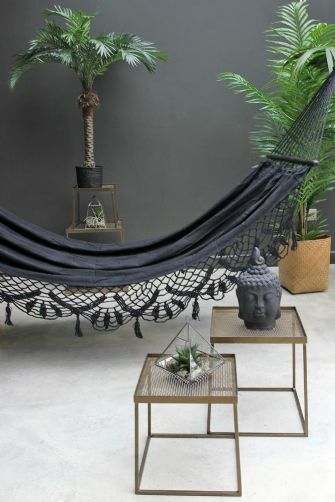 Dash & Albert have a fantastic range of indoor/outdoor rugs, poufs and cushions to make your outside space as cosy and homely as inside your home. 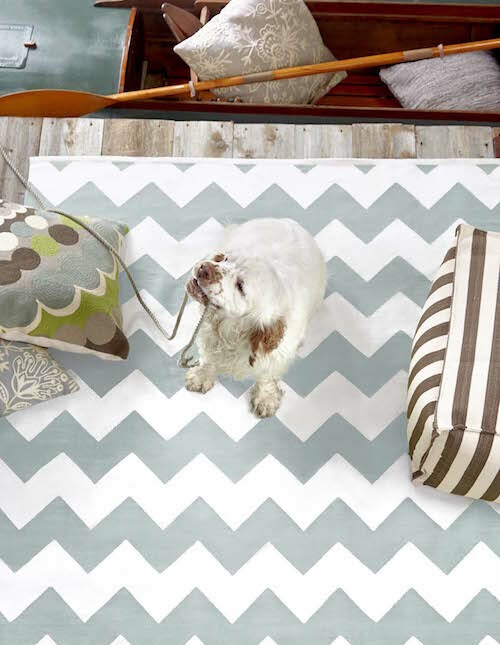 This lovely chevron rug is right up my street and I love that you can use it indoors and outdoors. Made of polypropylene, it’s great for high traffic areas, it’s super easy to clean and has been UV treated. See website for stockists. I can’t live without cushions, to me they’re an absolute necessity to everyday life. 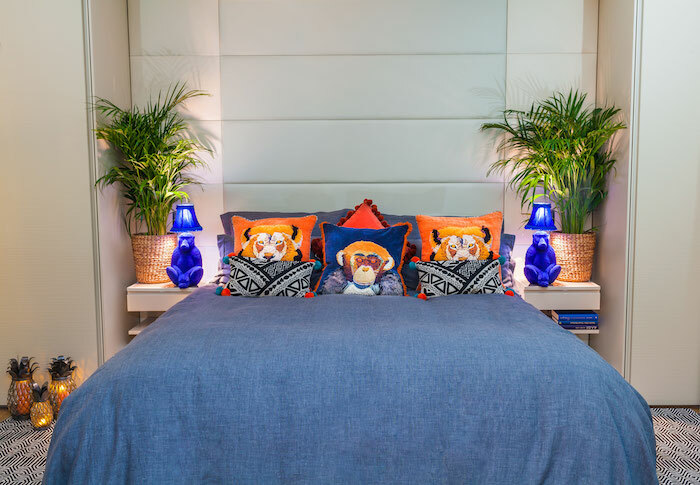 Dash & Albert’s range of indoor/outdoor cushions come in all sorts of striking colours and patterns to make you feel right at home when you’re not actually in your home. See website for stockists. 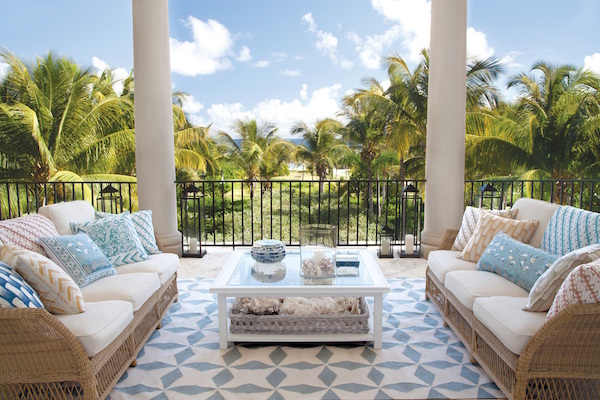 The Lucy Juniper rug is based on a vintage tile pattern and looks stunning on this terrace. Without the luscious green backdrop, this could easily be a smart sitting room. See website for stockists. 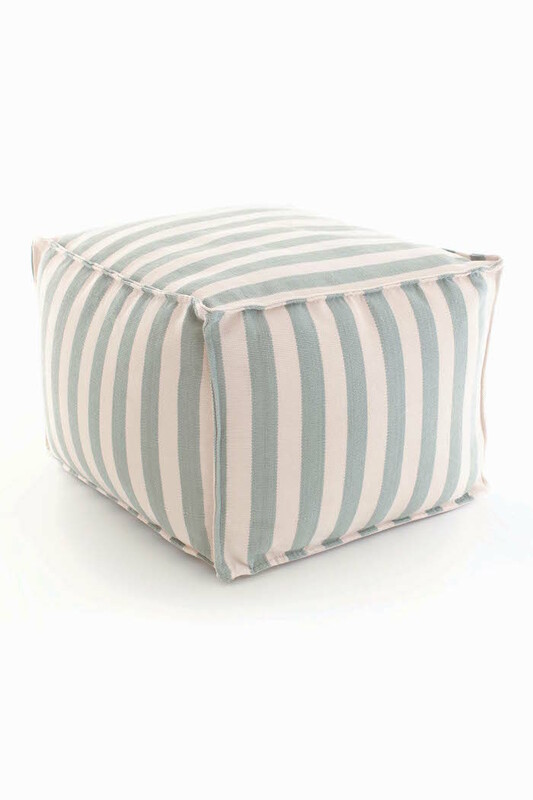 These versatile indoor/outdoor poufs are incredibly hard-wearing, making them brilliant for the patio, poolside and kids’ playrooms. See website for stockists. On a balmy summer’s evening, the sun may have gone to bed but you don’t have to. 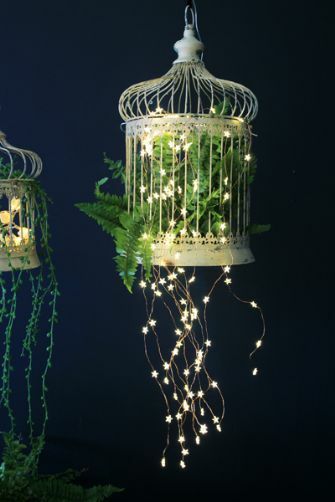 Keep the party going with some de-light-ful garden lighting. Just don’t forget the citronella candles to keep the mozzies at bay! 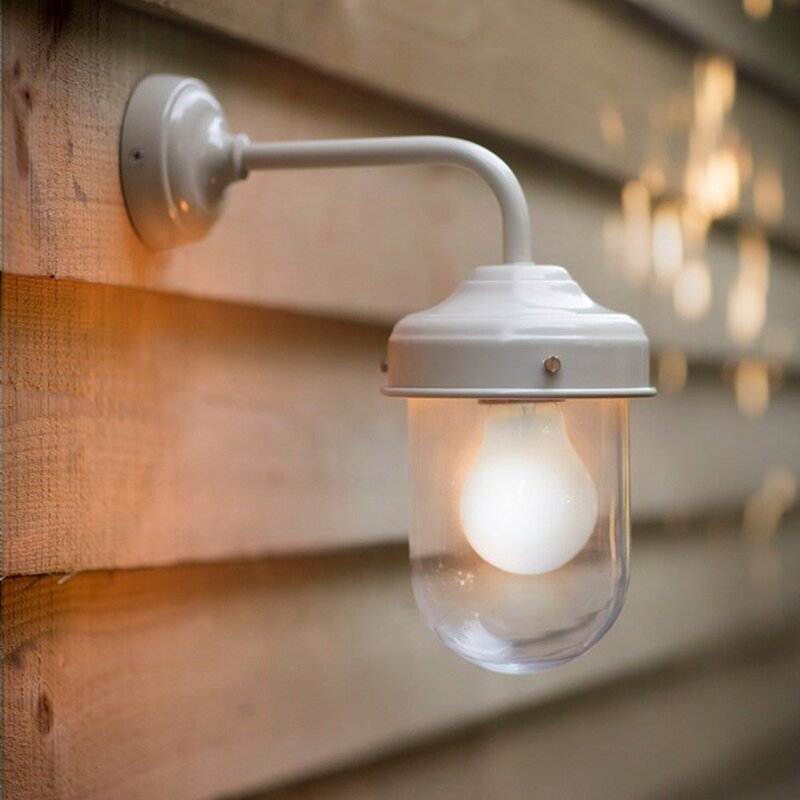 This industrial style exterior bracket light suits both contemporary and traditional styles and provides a useful glow once dusk falls. £298.80 from Davey Lighting. This beautiful star light spray creates a magical feature for any garden party. Use it indoors at Christmas or under a blanket fort. Available for £45.00 from Rockett St George. 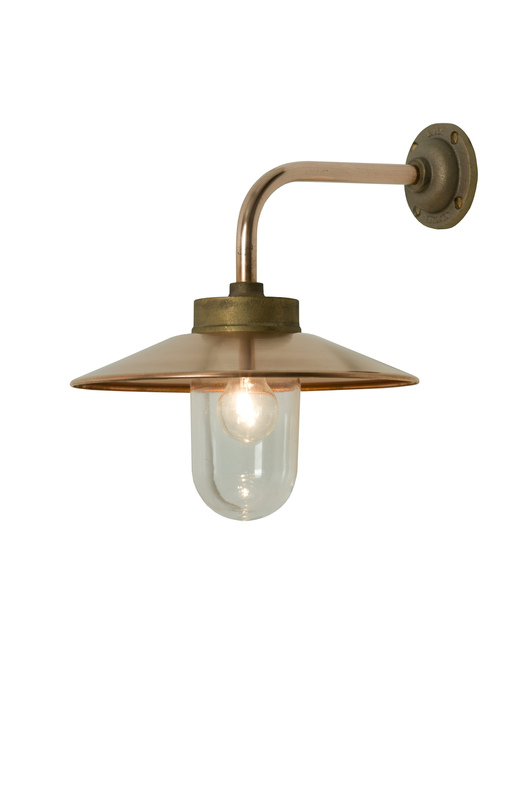 Davey Lighting’s square box pendant in weathered brass makes a smart addition to porches and covered terraces or patios. Available for £450.00 from Davey Lighting. Simple and elegant, this barn lamp in clay is a bestseller and it’s easy to see why. 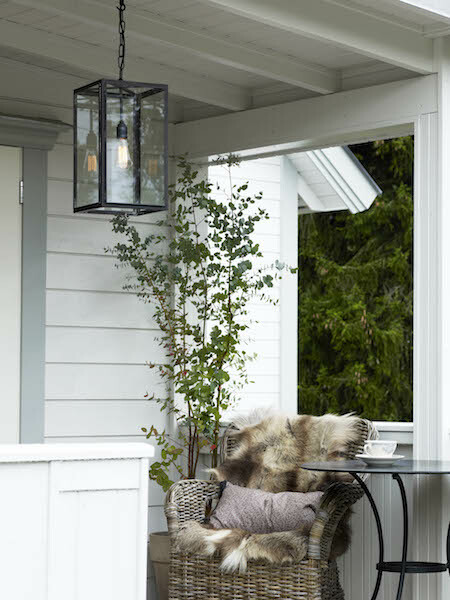 Front door, back door, anywhere you like, this lovely little lamp will light the way. £45.00 from Willow & Stone. As well as keeping those annoying bugs away, citronella candles smell divine. Plus, there’s nothing like a few candles to create a little atmosphere on a cosy summer night. 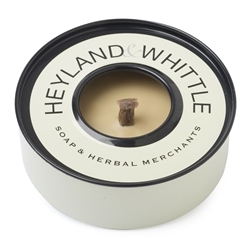 Available for £6.00 from Heyland & Whittle. Fire pits and fire bowls have been popular in the US for a while and they’re starting to appear in more gardens in the UK. You can get all sorts of styles and types from simple cast iron bowls to this sophisticated Hemi 36″ table top fire bowl from Solus Decor. It features a hardwood top allowing it to be used as a table when not in use as a fire bowl. Prices from £2,650.00. So here’s hoping the good weather is here to stay. Now that I’ve written this, I’m fairly certain it’s going to take a turn for the worse but no doubt it’ll be back again, and this time, we can be prepared.